Members of WWCH spoke to club members about shop safety and provided numerous tips on developing habits that will prevent accidents or at least minimize an event impact. From left to right, Bill Harris, Mark Bolinger, Ben Tillison, John Gay, and Mike Turner. 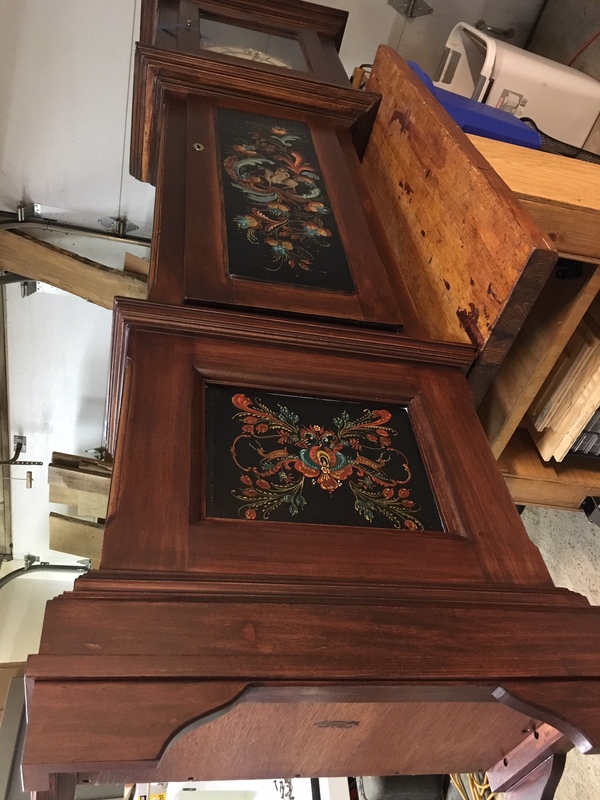 Dave Ward explained how he used different hardwoods to make eight trays with molding for the edges. For some Dave finished with bar top epoxy but the rest with spray polyurethane. With poster board for backing and finished with whitewash, Chris Farquhar crafted these wolves out of basswood. He probably won’t hang them on his front door for who wants wolves “at the door”? 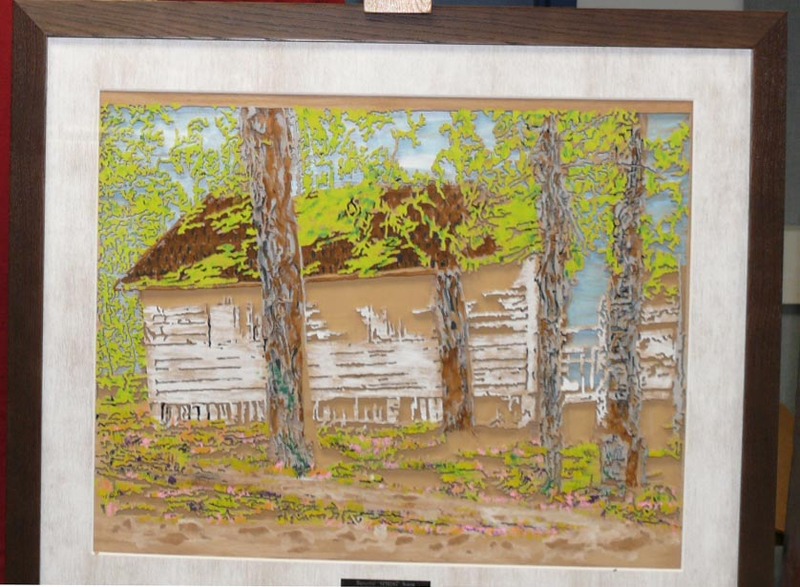 Rick Spacek showed a before and after version of his Spring Day scroll saw masterpiece. The after version is highlighted with coloring that draws out the features of his work. Bill Grimes made rattles of maple and cherry for his granddaughters that can also double as Christmas ornaments. It’s his kitchen so it’s his rules and Chris Schwartz says so in a sign he scroll sawed – his girlfriend better not be a chef. Chris obtained a scroll saw pattern from Charles Volek to craft a simple toy. A Sue Mey pattern was used by Steve Wavro for a wedding plaque for a friend of his daughter. Steve used a program, Inkscape, for the letters on the curve. The eagle is the mascot for the Barber’s Hill High School so Steve crafted one from 168 pieces in intarsia for sale at the Barber’s Hill Pilot Club auction. Two beautiful platters from construction site scrap plus some mahogany and a bowl of spalted pecan were turned by Larry Barron. The “cosmic” dust look comes from a watered down blob of acrylic paint sprayed with a blast of 3 psi air from an air compressor. Bob Wink showed his versions of folk art intarsia images of a riverboat in Europe, and two cityscapes. 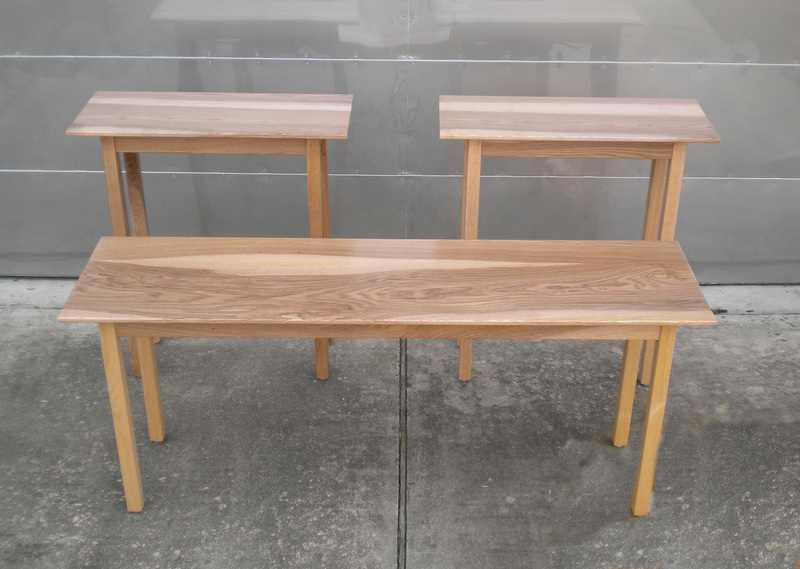 Cutting boards of walnut and hard maple and two with live edges were finished with a 50% mixture of salad bowl finish and mineral oil by George Alderete. 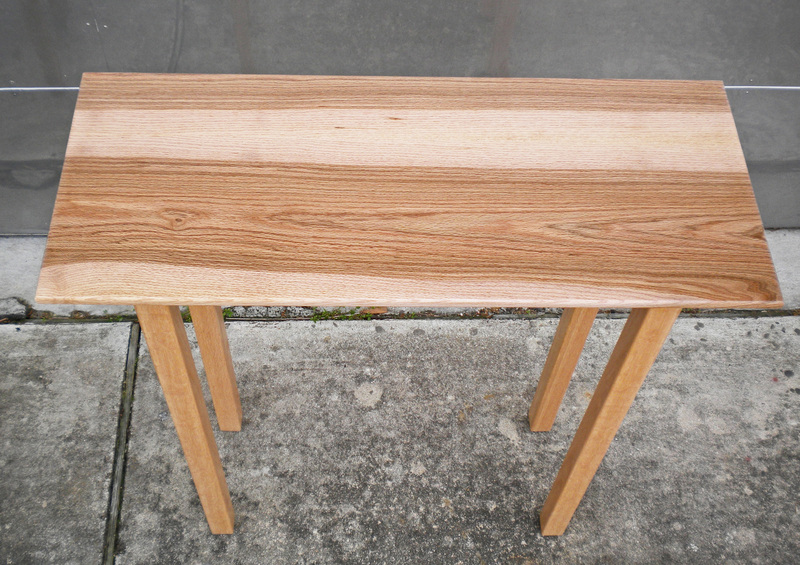 From water oak David Janowitz crafted three tables for a client. 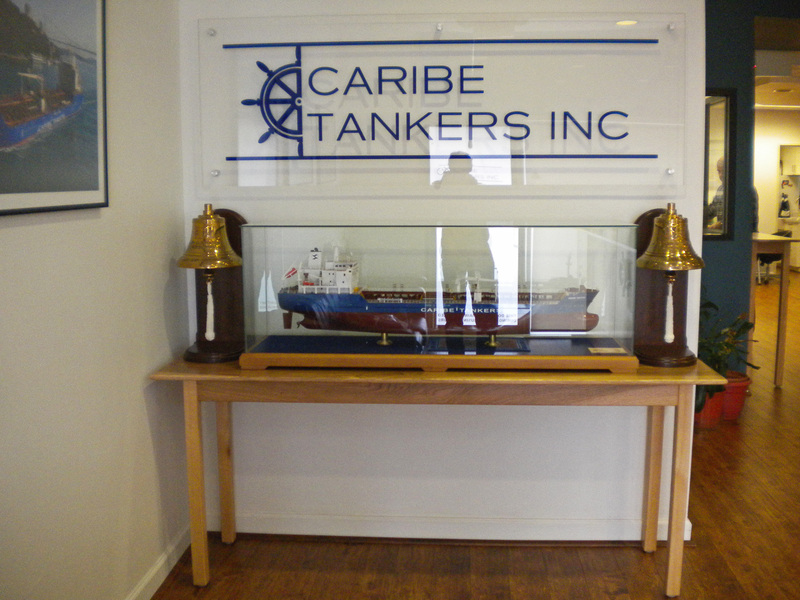 The finish is water borne polyurethane. 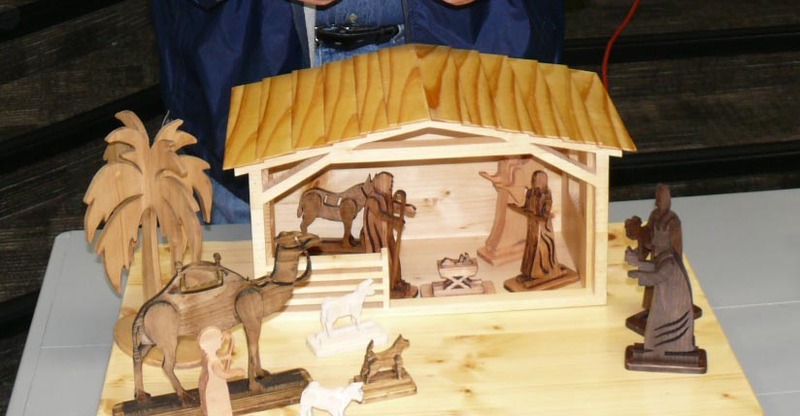 Using laminated spruce panels and a Steve Good pattern Norm Nichols crafted this nativity set. Not an easy project but was fun and will be available for sale at the craft show next week. 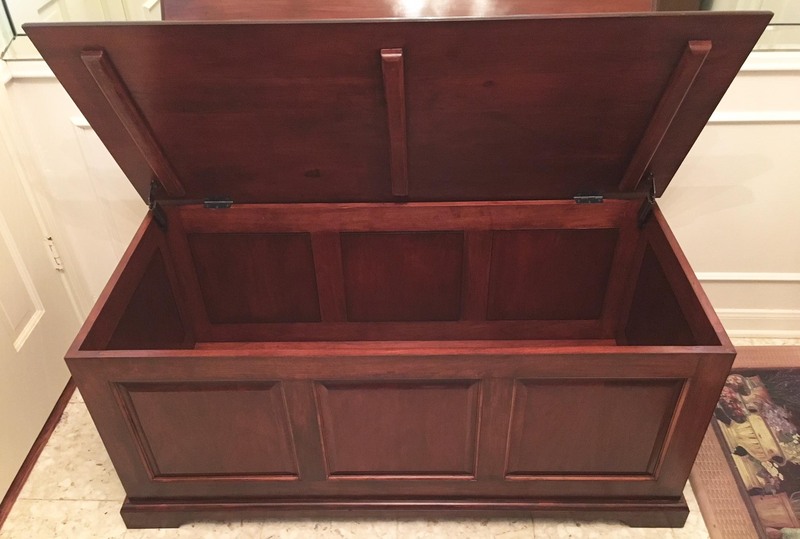 Henry Majoué walked club members through how he made effective use of 45 degree locking miters for some joinery to craft a blanket chest from cherry wood. 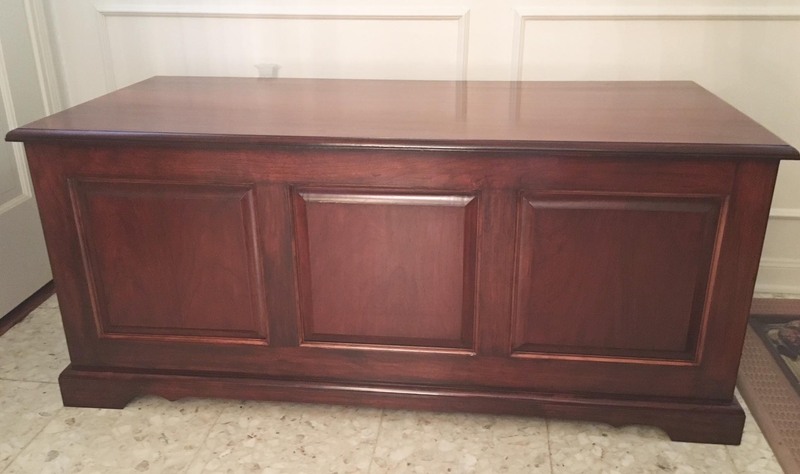 He finished with a mahogany finish. 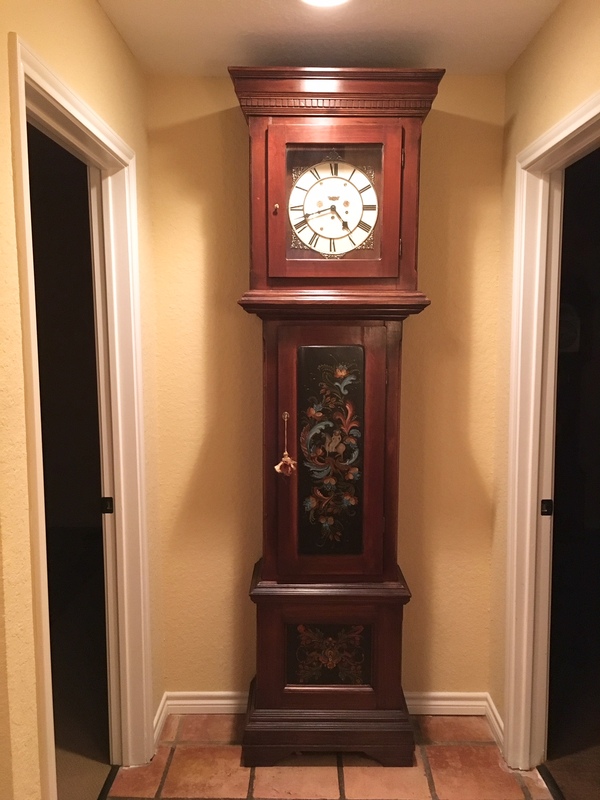 In these photos Henry showed what he did to restore a grandfather clock that was damaged in a flood. 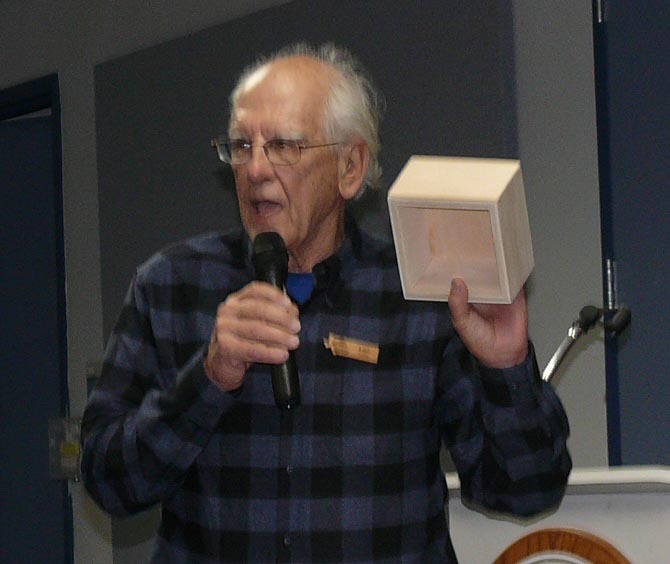 Lon Kelley showed how he produced six by six inch boxes for toys using lap joints that made it much easier to assemble. Axle wheels for toy cars forms the pegs for Tic-Tac-Toe games. Lon’s photo shows a clever way to drill several holes at one time with a long bit.